ROCKINGHAM – Thomasville’s Gary Ingold drew first blood Thursday when he beat former Carolina Coalition champion Tommy Plott of Winston-Salem by a razor thin .001 of a second to win the $5,000 prelim to the ATI Performance Products Top ET Challenge which begins today. Ingold, a racer not unfamiliar himself with the Rockingham Dragway winners’ circle, made a .007 of a second starting line advantage hold up for the win. Semifinalists Thursday were Shawn Carpenter of Elm City and Tim Phipps of Kenansville, whose 1998 Chevy Monte Carlo was the longest surviving door car. The ATI Top ET Challenge pays $10,000 to Friday’s winner, $20,000 to the last man or woman standing on Saturday and another $10,000 to the Sunday champion. Round 5 – Ross Freeman, Orangeburg, S.C., 1969 Chevy Nova, .013, 7.432 on a 7.410, 90.19 mph, def. Phillip Fryer, Effort, Pa., 1995 Ford, .031, 6.452 on a 6.420, 106.91 mph; Buddy Dial, Rowland, .005, 4.768 on a 4.740, 143.67 mph, def. Shawn Carpenter, Elm City, foul (-.005); Tim Phipps, Kenansville, 1998 Chevy Monte Carlo, .033, 5.062 on a 5.030, 136.93 mph, def. 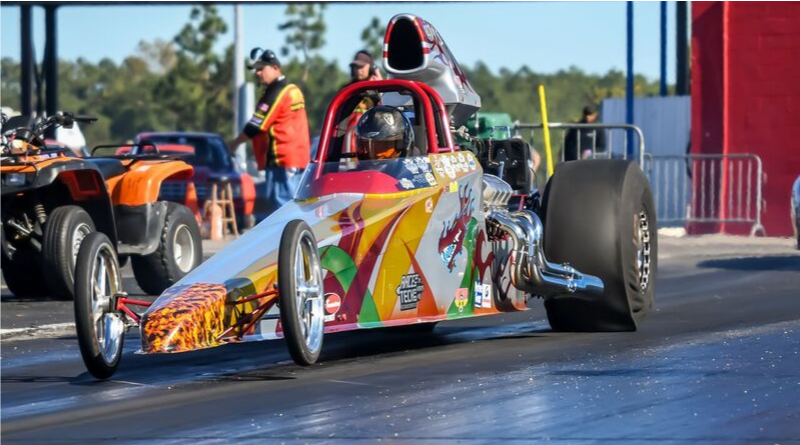 Howard Wesbury, Harleyville, S.C., Chevy Nova, .000, 5.861 breakout on a 5.70, 118.03 mph; Tim Thomas, Lumberton, .015, 4.702 on a 4.690, 142.51 mph, def. Paul Warwick, Lumberton, .021, 6.490 on a 6.470, 102.60 mph; Gary Ingold, Thomasville, .015, 4.670 on a 4.670, 145.77 mph, def. Josh Duggins, Inman, S.C., .003, 4.465 on a 4.450, 154.32 mph; Tommy Plott, Winston-Salem, .030, 4.610 on a 4.600, 149.27 mph, def. Daren Lotts, Waynesboro, Va., .020, 4.818 breakout on a 4.820, 140.01 mph; Shawn Carpenter #2, Elm City, .014, 5.858 on a 5.880, 115.77 mph, def. E.J. Womack, Lillington, foul (-.004); Jeff Parish, .011, 5.520 on a 5.520, 122.77 mph, def. Ross Freeman, Westville, S.C., 1970 Chevy Nova,, .012, 7.398 breakout on a 7.410, 91.97 mph. Round 6 – Carpenter, .014, 5.894 on a 5.880, 109.66 mph, def. Thomas, .008, 4.711 on a 4.690, 145.70 mph; Ingold, .009, 4.686 on a 4.660, 145.85 mph, def. Freeman, .020, 7.449 on a 7.400, 91.82 mph; Phipps, .028, 5.045 on a 5.040, 137.16 mph, def. Dial, .004, 4.752 breakout on a 4.760, 142.43 mph; Plott, .022, 4.605 on a 4.600, 149.51 mph, def. Parrish, .012, 5.508 breakout on a 5.510, 125.25 mph. Semifinals – Plott, .017, 4.619 on a 4.600, 148.84 mph, def. Carpenter, .017, 5.891 on a 5.870, 115.21 mph; Ingold, .012, 4.678 on a 4.660, 145.39 mph, def. Phipps, .020, 5.069 on a 5.040, 135.13 mph. FINAL – Gary Ingold, Thomasville, .009, 4.677 on a 4.660, 145.97 mph, def. Tommy Plott, Winston-Salem, .016, 4.631 on a 4.620, 148.62 mph. For more Rockingham bracket racing results, click here.